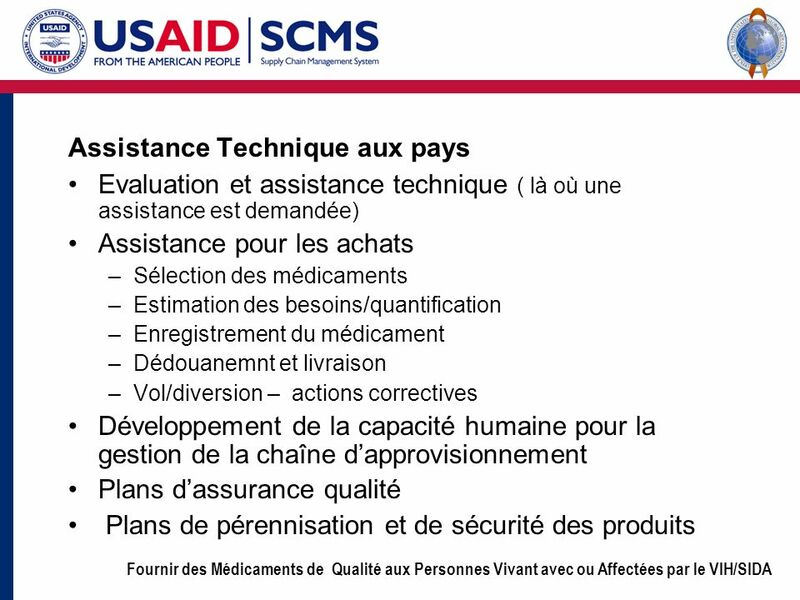 Evaluation et assistance technique ( là où une assistance est demandée) Assistance pour les achats Sélection des médicaments Estimation des besoins/quantification Enregistrement du médicament Dédouanemnt et livraison Vol/diversion – actions correctives Développement de la capacité humaine pour la gestion de la chaîne d’approvisionnement Plans d’assurance qualité Plans de pérennisation et de sécurité des produits First, and last (as I said), is in-country technical support. Among the things we can provide are— Assessments and TA: We can send a team to countries who invite us to do an assessment of activities already underway, and advise whether or how we can add value to them. 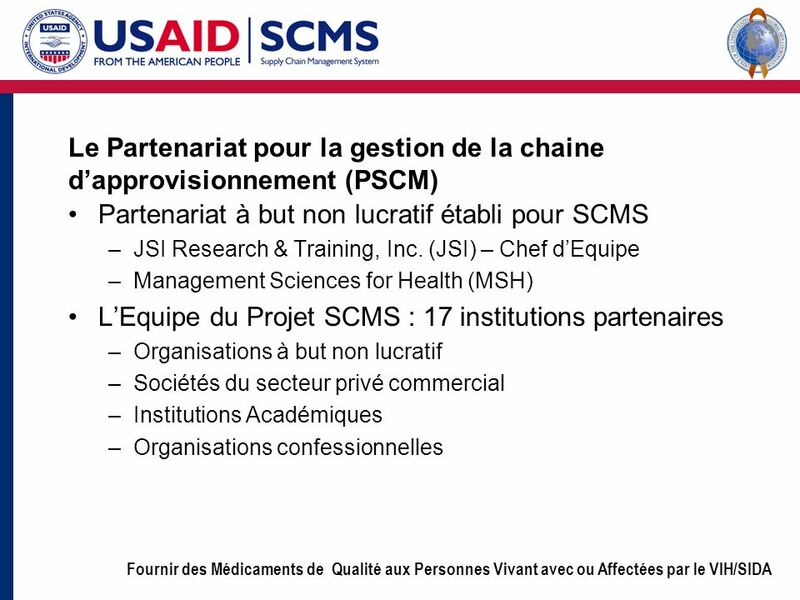 In many cases, JSI and MSH have already done this ground work through RPM and DELIVER. 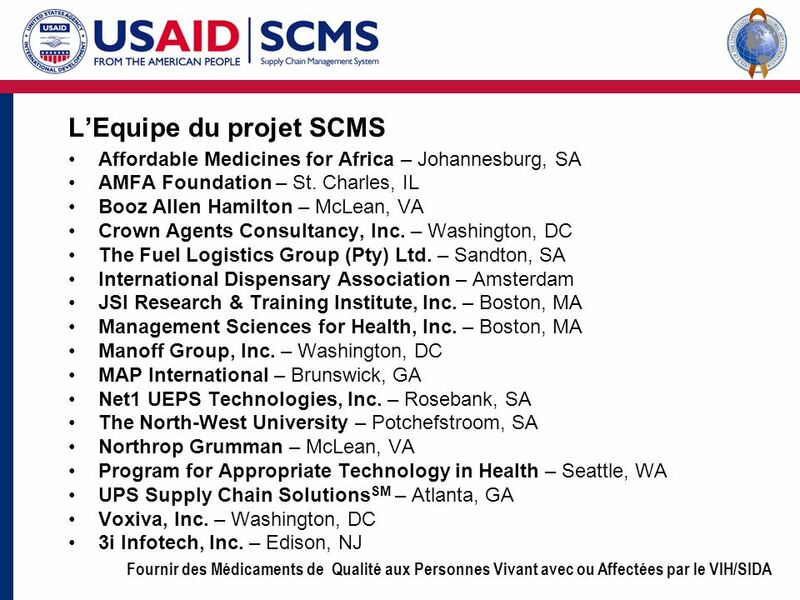 Among all the SCMS project team members, we have at least one existing office and frequently two or three in all 15 focus countries. So we wouldn’t be starting from scratch. Again, any TA we provide is intended to augment existing efforts. And it can range from occasional short-term visits to solve specific problems to multi-person long-term offices. 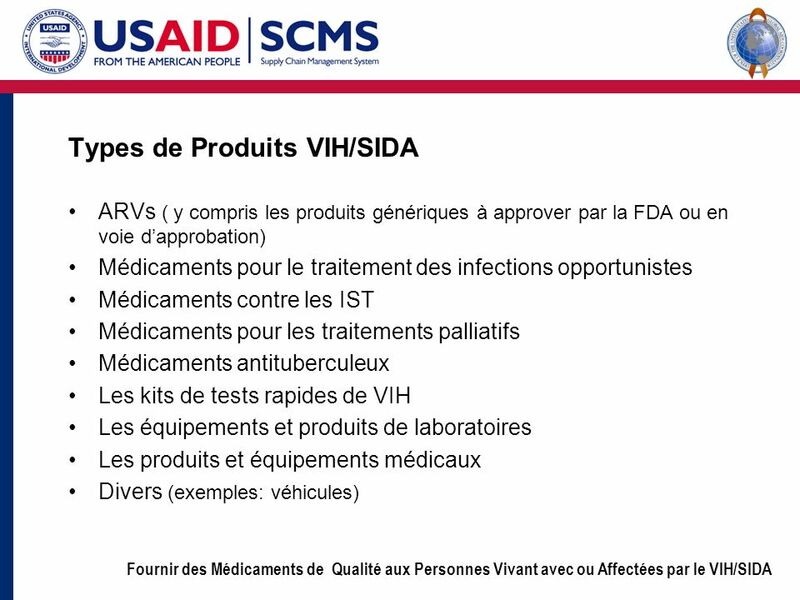 Procurement assistance: We can provide long- and short-term TA in everything related to procurement of HIV commodities. 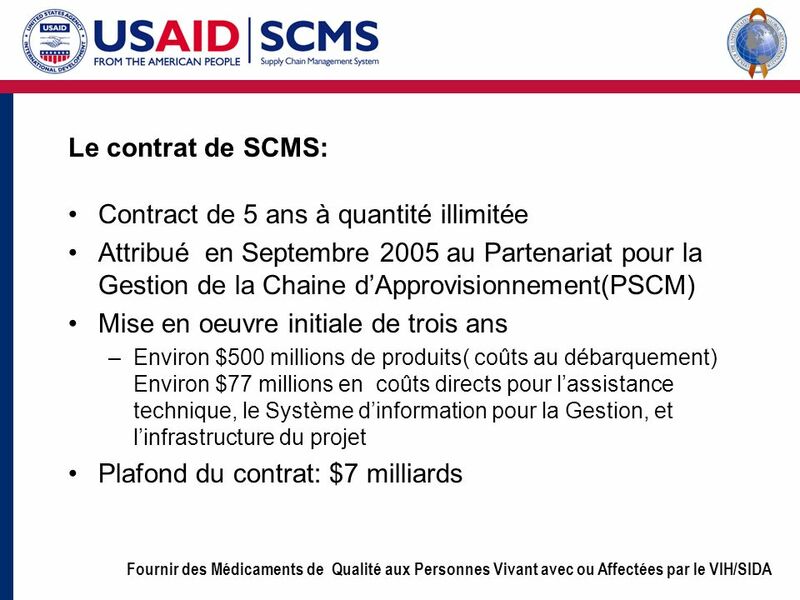 Obvious areas of work for products that SCMS is purchasing include drug selection, forecasting and quantification, and drug registration. But procurement assistance doesn’t have to be limited to products we are buying. We can help other donors and organizations that buy their own products too. Customs clearance and delivery: We can provide help getting SCMS-supplied products through the port and to the recipient. Who the recipient actually is will be an individual program decision. 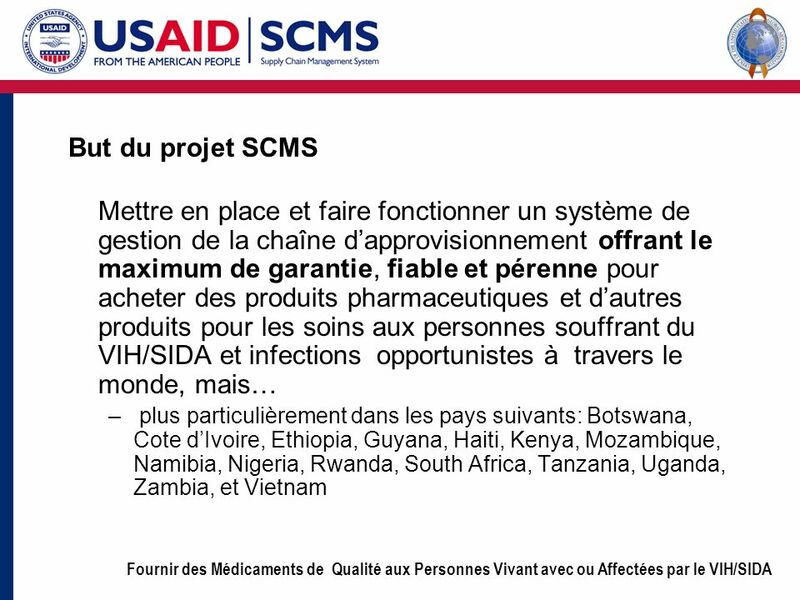 We anticipate delivering at least to the central medical store of a ministry of health, for example, but we can deliver directly further down the supply chain as requested, and help with improvements to programs’ existing distribution systems. 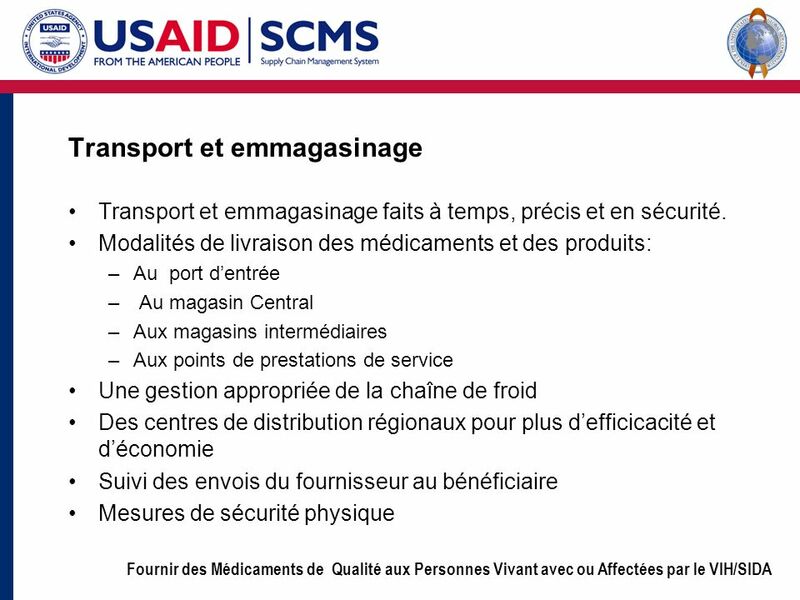 Theft and diversion: Particularly for ARVs, the physical security requirements will in some cases be much greater than any of our recipients has had to deal with in the past. Our team members—especially Fuel, Crown, UPS, and Net1—know more about physical security of commercial goods than anyone in the world. We can provide security at the level of fingerprints if it’s required. Human capacity: DELIVER, RPM, and other projects are already working in training and performance improvement for supply chain management. DELIVER and its predecessor projects alone stopped counting at 100,000 developing country staff trained. 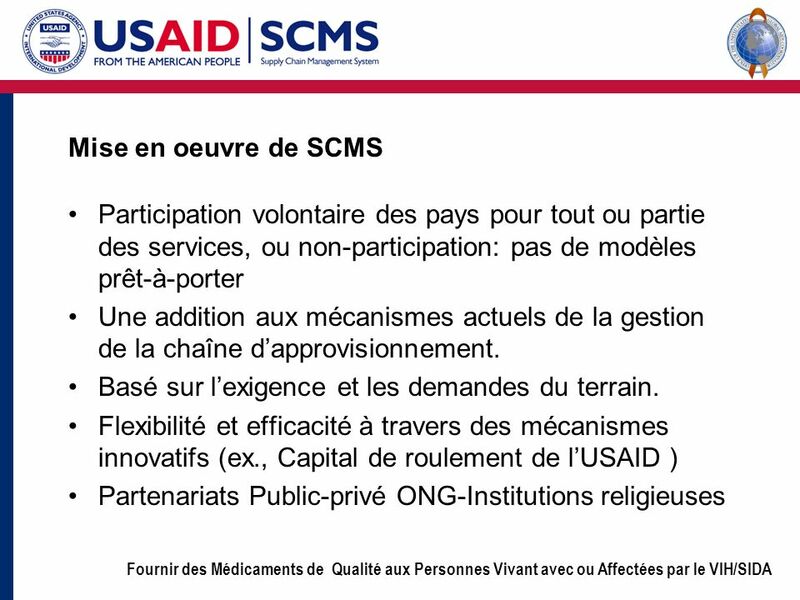 SCMS can augment these efforts as needed. 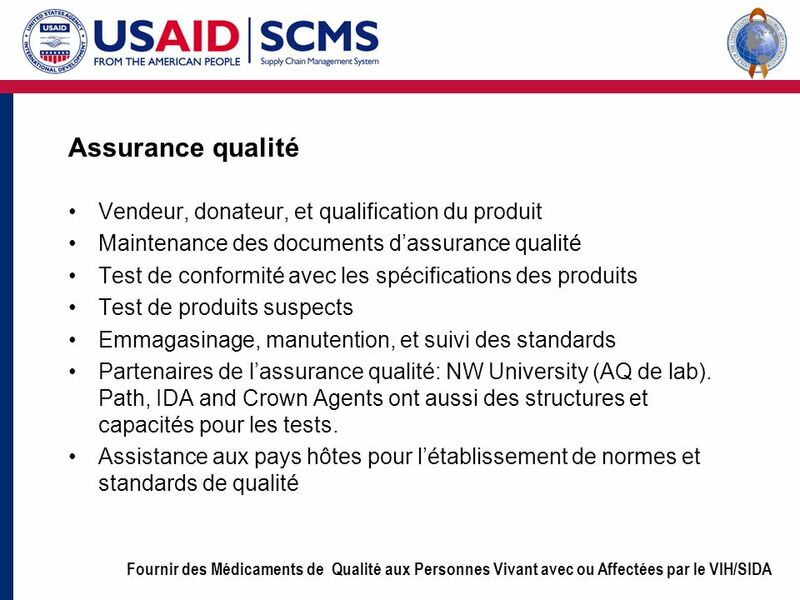 QA plans: We can help national organizations develop processes and procedures for ensuring satisfactory storage and shipping conditions in their own supply chains, for visual inspection of products, for establishing complaint ladders, and for sampling for testing of suspect products. 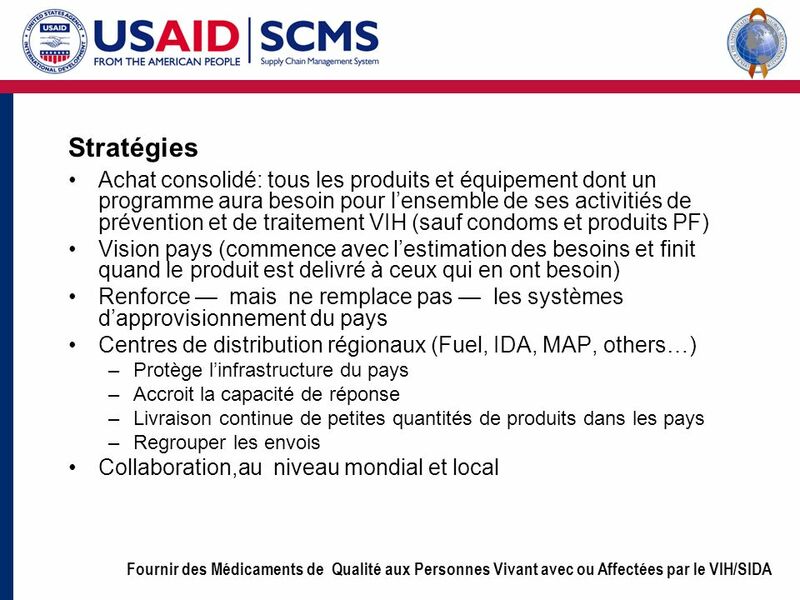 Sustainability plans: We can help develop plans for sustaining these sorts of activities that over time will allow host-country organizations to manage their distribution systems with less and less assistance from the likes of us. 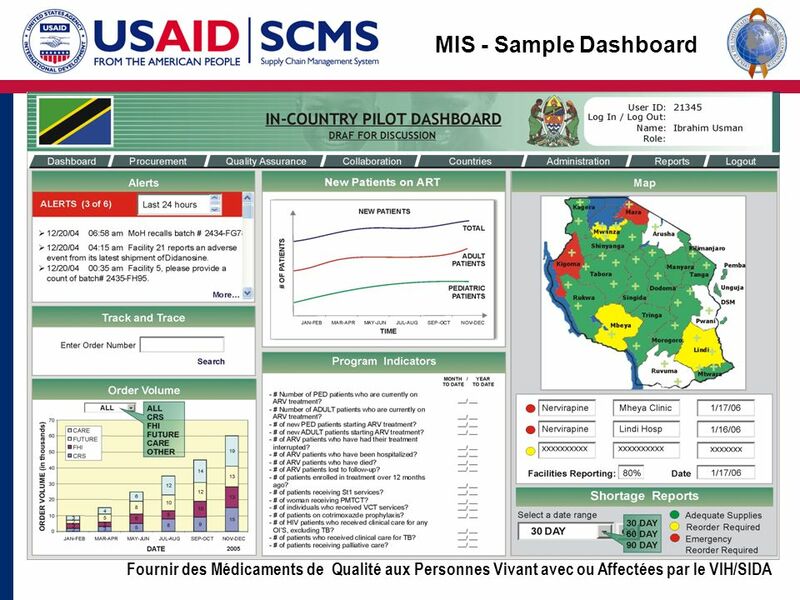 12 MIS - Sample Dashboard Something that SCMS will have in terms of management information systems that most other projects do not offer is a real time information dashboard. A Dashboard can give users essential continued performance monitoring through a web-based, global, real-time view of customer demand, inventory availability, shipment status, drug levels, patient status, etc. To keep users from being inundated with data, the system can use exception reporting, triggering alerts when something goes awry. The need for data varies according to the user. MIS can offer a wealth of information, but managers can choose what they want to see. 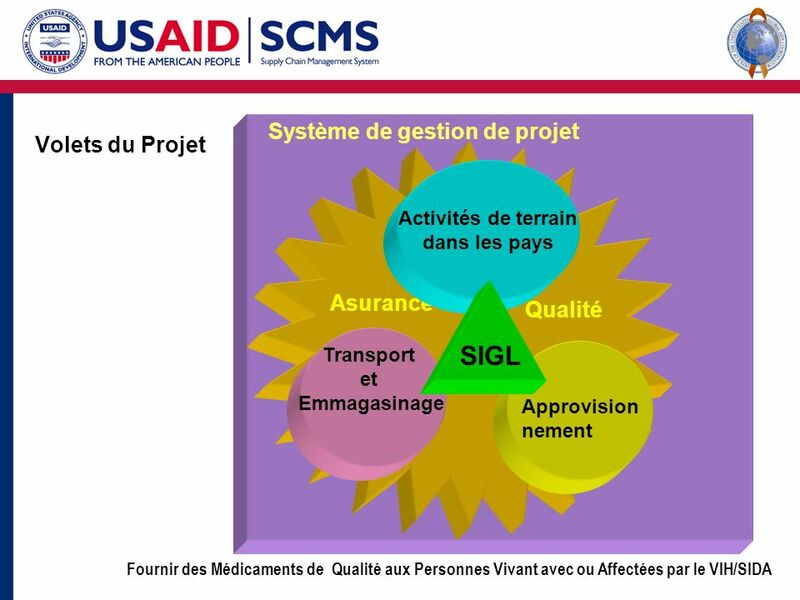 The system is available to every key leader in the SCMS, from USAID, OGAC, the PMO, Unit Staff to Country Managers, Partners and Facilities. Performance dashboards will be created for each of the 15 countries, with country-level maps and performance indicators relevant to that country (overall project indicators specific to that country, relevant indicators from functional areas - -for example if there is no procurement being done in that country, procurement performance indicators will not be displayed). In order to create, must Visualize key data and indicators broken down into components. Key questions: What information do you need to do your job? Where will the data come from to populate those indicators? What is the best way to see your key indicators? (i.e. graphs, table, chart, map, etc.) over what time period, how up to date? Who will have access to what items? 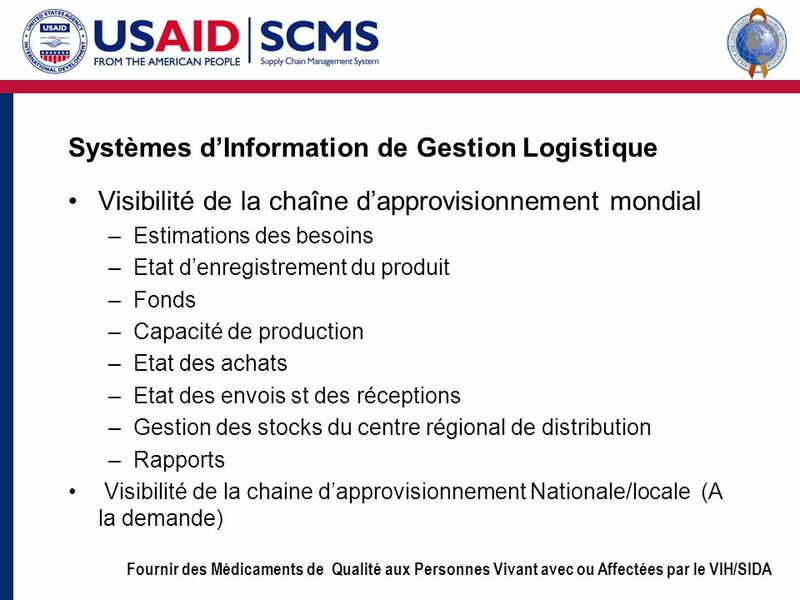 Visibilité de la chaîne d’approvisionnement mondial Estimations des besoins Etat d’enregistrement du produit Fonds Capacité de production Etat des achats Etat des envois st des réceptions Gestion des stocks du centre régional de distribution Rapports Visibilité de la chaine d’approvisionnement Nationale/locale (A la demande) We are mandated to establish a global supply chain management information system for the products we buy, and we can also work to establish or strengthen LMISs at the country level— “Supply chain visibility” is the commercial term for being able to see what’s going on further down the supply chain. At Wal-Mart, for instance, the manufacturers know what’s being sold at the cash register as soon as it’s sold. 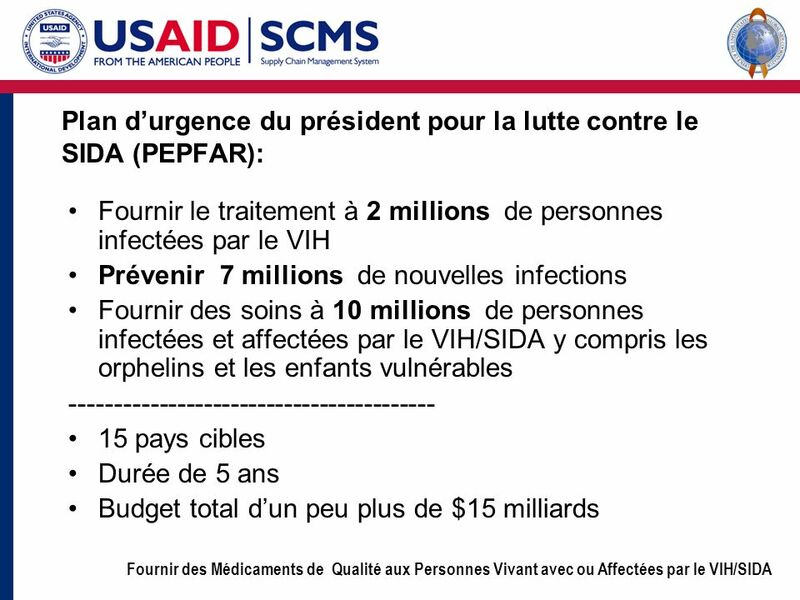 We can’t achieve that, but we need to provide better visibility than ever before for PEPFAR products. At minimum, we intend to be the repository for current information on requirements estimates, product registration, funds availability, production capacity, procurement status, shipment and receipt status, regional distribution center inventory management, and product returns. We plan to know all of this for products we procure, but at least some of these data apply to other people’s products as well. For example, requirements estimates are done for an entire program or nation, not for a specific supply source. We’ll work collaboratively to prepare requirements estimates, and share them with WHO, the Global Fund, Clinton Foundation, and others as appropriate. Similarly, product registration status information and production capacity issues are things everyone needs to know. We almost certainly won’t be able to get real-time data on shipments for other people’s products, but our requirements estimates will have to take them into account. Theft, substitution, and diversion are serious issues for manufacturers of ARVs and other products alike. Our information systems must be sufficiently robust to guarantee product pedigree from the supplier to the recipient. And as I said, we can work at the national or program level on request to strengthen local LMISs. The 3i Infotech/MSH system is available for those who lack a satisfactory system. 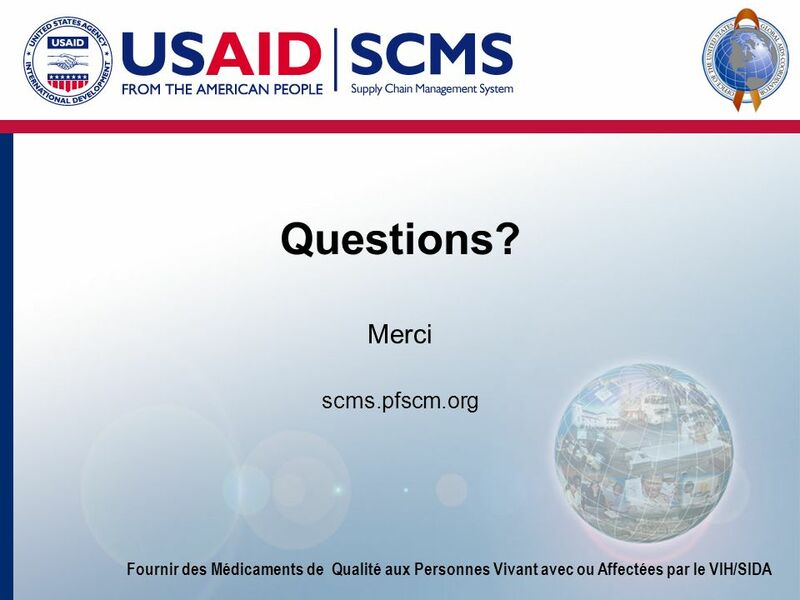 It would link directly into the SCMS global system where local organizations allow it to, and then we could be as responsive as Wal-Mart. We have several other software tools available—DELIVER’s Supply Chain Manager, for instance—which can also link to the global system. 17 Basé sur l’exigence et les demandes du terrain. 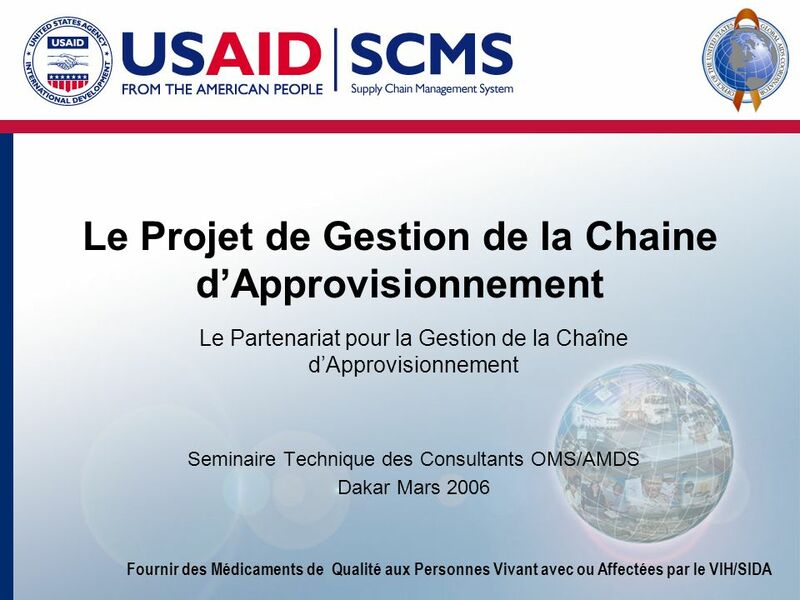 Télécharger ppt "Le Projet de Gestion de la Chaine d’Approvisionnement"
DONOR REPORTING REQUIREMENTS FOR ARVs AND RELATED DRUGS RWANDA CASE CONSULTATION MEETING GENEVA Octobre 2005. 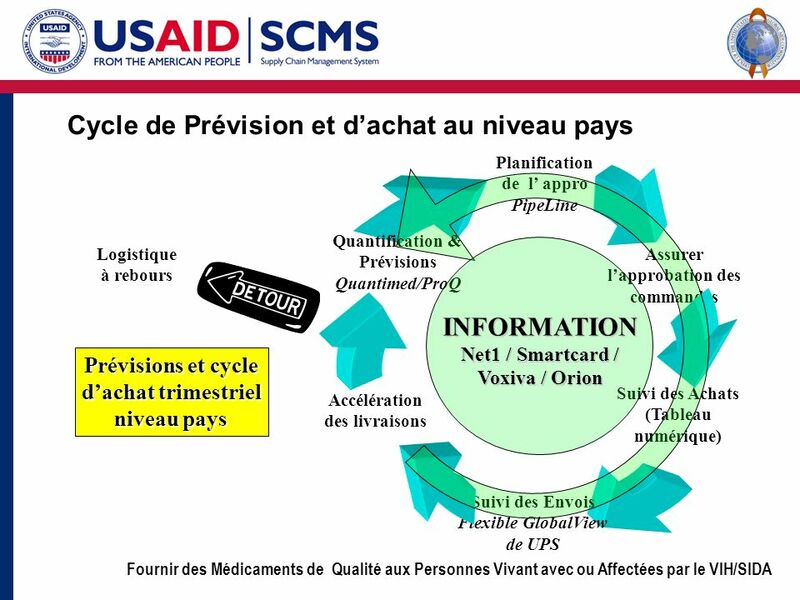 Utilisation Rationnelle des Médicaments dans le Contexte du Plan de Gestion des Achats et de lApprovisionnement. QUANTIMED. QUANTIMED Qu’est-ce que Quantimed? 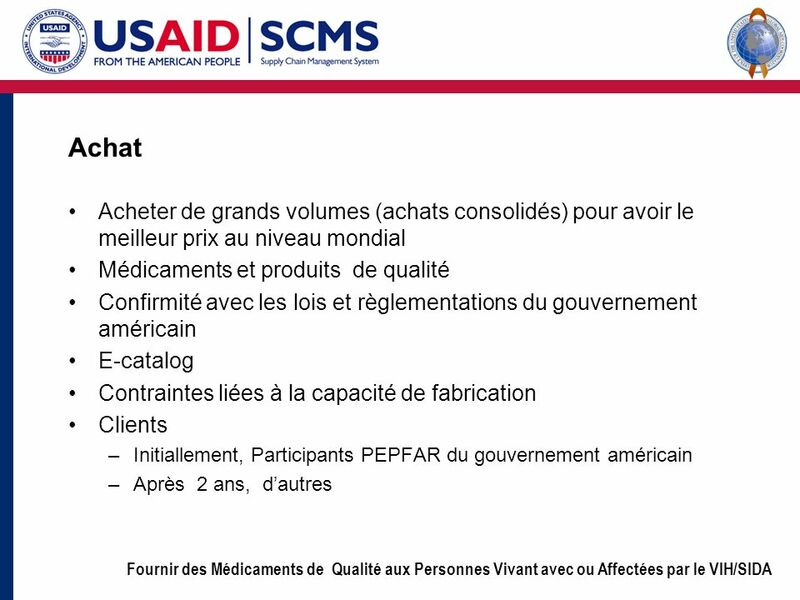 Un outil d’estimation des besoins des produits pharmaceutiques et des coûts.